When you visit the northern area of Okinawa, you will see tea plantation spreaded through out the skirts of mountain. Variety of teas are cultivated in Okinawa. The most popular tea out of all is the “Sanpin-cha” (cha means tea in Japanese). The word “Sanpin” means Jasmine, this tea is a flavored tea where you can enjoy fresh flower scent. 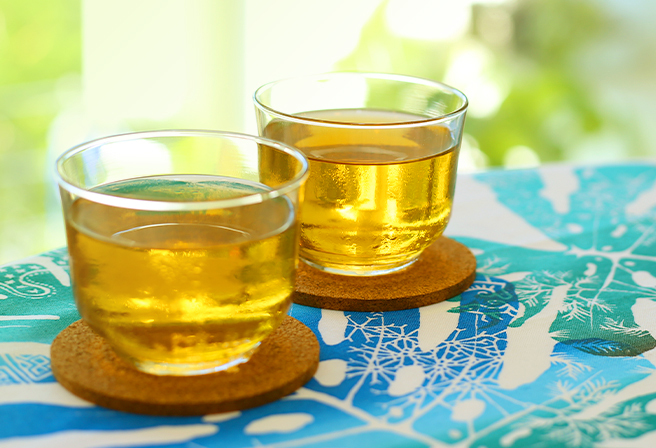 The “Sanpin-cha” is a good match with Okinawan cuisine, and is recommended for hydration on a hot summer day. Not only it promotes digestion, the scent of flower gives relaxation effects, and very good for fatigue recovery. A lot of these Okinawan tea has herb and vegetable as its main ingredients, and considered as a “healthy tea”. The “Ucchin-cha” is known as one of these “healthy tea”. “Ucchin” is a type of spice called turmeric used for curry. It contains plenty of antioxidant and minerals, and has many good effects such as hangover prevention, carcinogenesis and arteriosclerosis prevention. There also is a tea made from Go-ya (bitter gourd), which is Okinawa’s special product. The “Go-ya-cha” is made by roasting dry sliced Go-ya. It contains plenty of vitamin C and carotene, and it prevents lifestyle related diseases and also effective for diet. There are other herb teas like “Guava-cha”, “Yomogi-cha (mugwort tea)”, and “Kumisukuchin-cha (a type of herb called Orthosiphon Stamineus)”, we recommend these healthy Okinawan tea for your souvenir. The Best Season is Rainy Season for Okinawa’s Hydrangea!